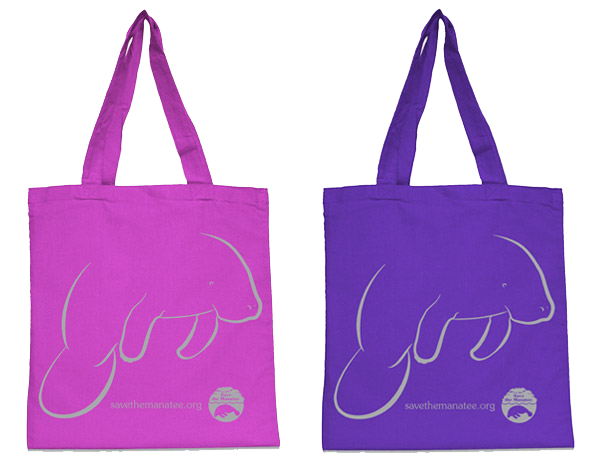 Adopt-A-Manatee at $35 or more and get a free tote bag! Welcome in spring with a manatee gift adoption for someone special from Save the Manatee Club. Adopt a real manatee with a known history and help to save imperiled manatees and manatee habitat wherever it is threatened. Tax-deductible gift adoptions from the Club cost $25 and include a full-color photo, adoption certificate, and biography. Also included is a membership handbook filled with photos and information, subscriptions to the Club’s official newsletter, The Manatee Zone, which is published four times a year and includes updates on the manatee adoptees, and the bi-monthly e-newsletter, Paddle Tales, with current manatee news and videos, plus a year’s membership in Save the Manatee Club. 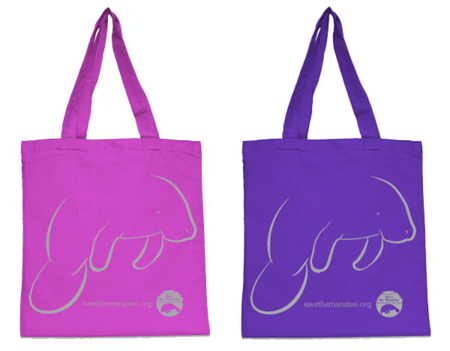 In addition, adoptive “parents” who adopt at $35 or more are eligible to receive a FREE tote bag with a manatee design in purple or pink (supplies are limited). Postage is free within the United States. See all the manatees up for adoption. Seven-year-old Hunter from Gadsden, Alabama, is a “Star Wars” fan and is also very fond of manatees. His aunt, Taylor Garrard, also an Alabama resident, adopted a manatee for her nephew as an Easter gift last year. She chose popular adoptee, Gator, from the Club’s Blue Spring State Park Adopt-A-Manatee® program in Orange City, Florida. Gator was first identified in 2011 at the park. Spotted on the Club’s webcams (ManaTV.org) located at the park, Gator has been seen chasing and playing with an alligator in the spring run, and that’s how he got his name. 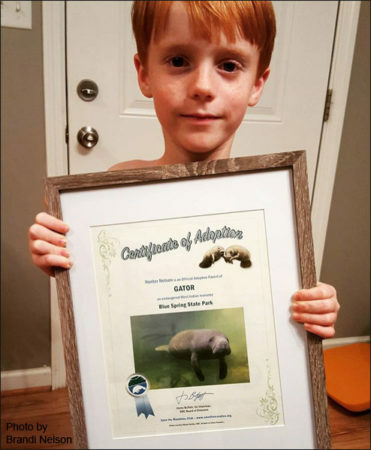 Hunter was excited when he received a manatee adoption for Easter last year, and asked to have his adoption certificate of “Gator” framed. The Club’s adoption program helps fund scientific research, education and public awareness projects and materials, rescues of injured manatees and orphaned calves, and conservation programs in the United States and around the world. Legendary singer and songwriter Jimmy Buffett co-founded Save the Manatee Club, a national nonprofit advocacy organization, in 1981, along with former Florida Governor and U.S. Senator, Bob Graham. Learn more about manatees and how to adopt one by visiting Save the Manatee Club’s website at savethemanatee.org, or by calling toll free at 1-800-432-JOIN (5646). Follow the Club using Twitter, Facebook, Pinterest, and Instagram. Check out manatee videos on YouTube. Note: A high resolution jpeg (300 dpi) of a manatee image, as well as a photo of Hunter Nelson, are available upon request. Also, ask for the Club’s new print spring public service advertisements, available in three sizes.